John Kerry has won a huge victory in the New Hampshire state primary, boosting his campaign to become the Democrat challenger to George Bush. With 97% of votes counted, results gave the Massachusetts senator 39% compared with 26% for closest rival Howard Dean. Last week, Senator Kerry was the surprise winner in the first stage of voting in the state of Iowa. "I love New Hampshire and I love Iowa too," Senator Kerry told jubilant supporters at a campaign gathering. About 200,000 voters participated in the primary - well above the previous record of 170,000 in 1992 when Paul Tsongas defeated the future Democratic nominee and president Bill Clinton. Correspondents say the scale of Senator Kerry's win will give him vital momentum for the primaries that lie ahead. 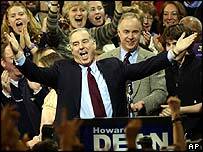 But former Vermont governor Dean, who improved on third place in last week's Iowa caucuses, said he was pleased with his performance. "The people of New Hampshire have allowed our campaign to regain its momentum," Mr Dean told his supporters. "We really are going to win this nomination, aren't we?" he said, adding: "We can change America and we will." The BBC's Rob Watson in Manchester, New Hampshire says that second place will be enough to keep Mr Dean in the race, but it is clear the initial enthusiasm for his campaign, marked by opposition to the war in Iraq, is not translating into electoral success. The contest now moves up a gear when voters in seven states from Arizona to South Carolina get to have their say on 3 February. 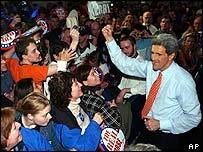 Senator Kerry told his cheering supporters at a Manchester hotel it had been a "successful and happy campaign". 29 states permit "open primaries" in which a voter may back a candidate regardless of party affiliation. Interrupted by chants of "Bring it on", Senator Kerry retorted: "I intend to". "I ask Democrats everywhere to join us so we can defeat George W Bush and the economy of privilege, and so that we can fulfil the ideal of opportunity not just for some but for all Americans," he said. Senator Kerry took a swipe at what he called "influence peddlers, the polluters... the Big Oil and the special interests", repeating his warning to President Bush from Iowa: "We're coming, you're going, and don't let the door hit you on the way out." Our correspondent says there was a sense among Kerry supporters that this was political history in the making. He says that, with two victories under his belt, John Kerry has a momentum that will be hard to stop. As results flowed in, contenders Senator John Edwards and retired General Wesley Clark vied for third place. Senator Joe Lieberman pledged to continue his campaign despite trailing in fifth. Residents braved freezing temperatures to cast their ballot, some arriving in snow ploughs. Our correspondent says, as was the case in Iowa, Democrat voters seemed less concerned about the fine print of the candidates' policies than their ability to beat Mr Bush in the November election. As one voter put it, she would vote for her cat if she thought it could defeat the president. The Democratic race is the current focus for the US election campaign, since no Republican challenge to Mr Bush seems likely. "Kerry is riding the crest of a wave that could take him to the nomination"